Description: This volume analyzes the processes of both curating sound artworks and their phenomenological nature. The essays analyze sound art as well as the resistance of sound—as an art material—to spaces conceived for silent visual artifacts. The institutional caging of sound art becomes a struggle that frustrates the rebellious nature of sound-based works and artistic practices. These essays provide a variety of perspectives on the rebellious nature of sound art still attempting to resist being caged in ‘tried and true’ settings and taxonomies. Reference this volume: Lanfranco Aceti, James Bulley, John Drever, and Ozden Sahin, eds. 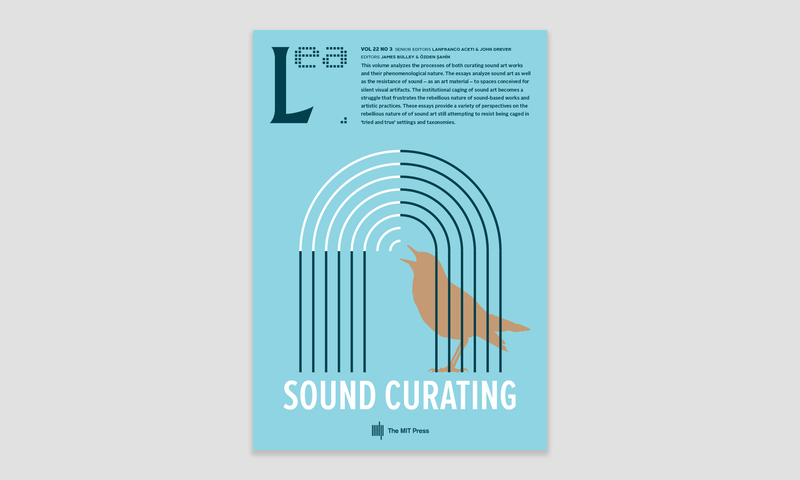 Sound Curating. Cambridge, MA: LEA / MIT Press, 2018. Birdcage is a curatorial experiment initiated in 2009 as an itinerant and temporary sound-based exhibition space traveling around the globe. It is a gallery that constantly redefines itself to respond to the contexts in which it settles for each episode and through dialogue with participating artists. Focusing on the immateriality of sound, Birdcage challenges site and gallery-space as settled notions, to reconsider them within a broader network of relations and social factors. This paper explores the practical implications of sound-based works entering the gallery space in London in recent decades. Issues with the term ‘Sound Art’ are discussed, and a review of sound art’s relationship to the arts institution is carried out. The common ground between, and overlapping concerns of ‘New Media Art’ and ‘Sound Art’ are investigated. Curatorial concerns are drawn from interviews conducted with members of London based organisations: Mark Jackson of Image Music Text Gallery, Matt Lewis and Jeremy Keenan of Call & Response, and Helen Frosi of SoundFjord. Independent sound artists Paddy Collins and Pia Gamberdella of Brown Sierra make further contributions to the discussion. In this review of the vibrant and rapidly evolving sound art scene in London, I will confront the curatorial factors that seem to deny sound art works a wider distribution and audience, describing the ways in which these problems have hindered sound art’s inclusion in wider contemporary art discourse. The purpose of this essay is to present and reflect upon our practice as sound artists and musicians who collect and perform with an array of objects and playback media. Our practice draws together interventions with books, records, reel-to-reel & cassette tape, music boxes, electronic circuits, field recordings, short wave radio transmissions, and sundry paper ephemera. These collections operate as both personal archive and score/instrument, either privately or in public performance (e.g. with noise/improv group Rutger Hauser). They also function as playful antidote to the administrative gravity of our professional careers. We can report no conclusions other than our vocabulary. Dr. Alan Dunn, Senior Lecturer at Leeds Beckett University, reflects upon his sound art project Artists’ uses of the word revolution in relation to pedagogy, curating and distribution. The project formed part of a new pedagogic model established at Leeds between Dunn, Chris Watson and visual art students, exploring the spaces between sound recording and sound recordings, and between lecturing and administration. The curatorial methodologies deployed throughout the project considered some of the core behavioral drivers that lead professionals and amateurs to return to the record button and why we often revisit the same themes when recording. The current paper investigates the aesthetic, sensory and live aspects of sound through the conceptual and cultural impact of the flaneur and psychogeography in contemporary and technologically mediated walking practices in the city. Various approaches based on the traditions of flaneur, psychogeography and performative walking as art have reverberated throughout the 20th century, yet mostly they have been founded upon the visual. Culturally speaking, these approaches have not only made walking a dynamic process of aesthetic, poetic, sensory and political potential, but have informed later contemporary art practices by revealing emerging hybridities. Within the curation, theorization and production of sound art we find a predisposition towards immersion and interiority. It is argued herein that auditory culture’s perceived privilege with regard to immersion, immanence and interiority is not only inaccurate but limits the critical and epistemological scope of sonic practice. By initially situating this critique within the terms of Jacques Derrida’s critique of phonocentrism, the exteriority considered proper to writing yet antithetical to sonic immersion is taken up as an initial means of escape from the epistemological constraints of interiority. Initially using Derrida’s theory of writing to help unbind theorization of sound in the arts from affirmations of affective interiority, it is argued that Derrida does not take us far enough, leaving us in a situation where everything is reduced to a play of texts. Ever since artworks have incorporated sound in contemporary art museum spaces, scholars have either looked at the materiality of these sounds, or sought to read them conceptually. Consequently, little is known about the ways in which museum visitors actually listen to sounding artworks. Exploring the boundaries of contemporary art theory, museum studies and listening phenomenology, this paper sets out to investigate the contemporary art museum as a space for listening, and seeks to define ‘Explorative Listening’ as a possible manner of listening in the museum.